Competitors must submit an audition tape and upon approval, must be pre-registered to compete in the Lyrics for Life competition. Audtion tapes must be submitted to Dan Palmer at: vocals@transplantgamesofamerica.org. Tapes must be recorded and uploaded to YouTube. Semi-finals will be held on TBD and Finals will be held on TBD. Semi-finals and finals will take place as part of the Transplant Games in New Jersey and be conducted at the TBD. All competitors must first meet all Conditions of Entry as outlined in the “Waivers” section of this website. Competitors will be judged on both technical issues and overall presentation. Technical issues will include pitch, vocal quality, originality, phrasing, and rhythm. Overall presentation will include musicality, stage presence, and audience appeal. Judging will vary depending upon the phase of the competition. The process will include input from qualified music professionals, celebrities and luminaries. People’s Choice award will be by on-line voting of qualified semi-finalists. Semi-finalists will perform one (1) song not more than three and a half minutes in duration, with musical backing track if desired, before the Transplant Games audience and a panel of judges. Finalists will perform two (2) songs not more than three and a half minutes in duration, with musical backing track if desired, before an audience and a panel of judges. Decision of judges will be final. Video audition submission deadline is TBD. Auditions will be limited to the first 100 submissions. Medaling is not gender or division specific and will be awarded to first, second, and third. An additional People’s Choice selection will be awarded based on on-line voting results. Competitors must submit one (1) unedited 90-second video of themselves singing a song of their choice. Cell phone videos are encouraged. Video quality will not be judged. However, as this is a vocal competition, the sound must be of sufficient quality to clearly hear contestant’s voice. It is recommended that recording takes place indoors in a quiet environment. Judges will select twelve (12) semi-finalists. Semi-finalists will be notified via e-mail the week of TBD (or earlier). Audition videos of semi-finalists will then be posted on-line for People’s Choice voting. Registration for the 2020 Transplant Games is not required for consideration during the audition phase, but registration must be completed prior to final acceptance as a semi-finalist. Semi-finalists will perform one (1) song not more than three and a half minutes in duration, with musical backing track if desired, before an audience and a panel of judges. Judges will determine finalists. Finalists will perform two (2) songs not more than three and a half minutes in duration, with musical backing track if desired, before an audience and a panel of judges. Winners will be announced upon completion of finals competition. As stated in the Vocal Competition guidelines, digital video audition submissions are due by TBD. Auditions must be performed live, be unedited, and have no musical background. We want to hear you, and only you. You must upload your audition video to an appropriate video site. YouTube is free and it’s relatively easy to set up an account and upload to. Any similar site where we can easily view your audition video is acceptable. Once your video is viewable, please double-check the link and then send that link to vocals@transplantgamesofamerica.org Links are the only acceptable means of submission. On your audition video, please state your name before you begin singing, so we know who you are. If selected for the semi-finals, you will be expected to provide your own back-up tracks unless you’ll be singing acapella. Good quality backing tracks can be obtained on-line at a number of websites for a small fee. Tracks are $1.99 each for standard arrangements, $2.99 for custom arrangements (your choice of instrumentation and key). Background tracks must be on thumb drive, CD, or downloadable mp3. They should be clearly marked with your name and contact info along with the song name in order to avoid confusion. Musical instruments should have an XLR or 1/4" output. 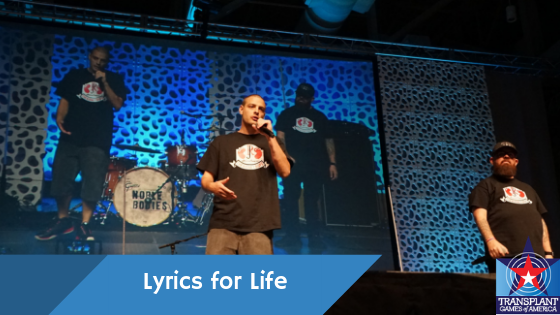 Once an event is completed and results are available, Lyrics for Life staff must record all competitors and times/scores to the appropriate system/documents. When electronic scoring is being utilized a manual backup system must be in place to record results.